In 1809, territory was procured from the Indians which was called the Twelve Mile Purchase. The Purchase added area to Wayne County and the west boundary runs through the center of Jefferson Township. Land on the east side was for sale from the Federal Government in 1811. It was not until 1818 that land on the west side of the line could be bought. People had already settled there. When the land was for sale, some could not afford to buy the farms they had carved out of the forest. About 1822 Jefferson Township began to grow in population. The town of Hagerstown was platted in 1832. By 1834 enough people lived in the community to want their own township. Jefferson was formed from Jackson on the south and Perry on the north. Religious groups had organized as early as 1816, with Salem Baptist Church being first. The congregation still meets in the little country church on Salem Church Road. In 1820 a group with strong religious convictions settled in the Nettle Creek Valley near Hagerstown. German Baptist or Dunkards, had to come to the United States from Germany after enduring mush persecution in the 1700’s. The group which settled in Jefferson Township migrated from Pennsylvania to Ohio and eventually into Wayne County. The Nettle Creek Church congregation formed in 1820, meeting at homes until a large brick church was built in 1844-1845. The German Baptists wore distinctive dark clothing similar to the Quakers. The congregation grew so large that several chapels were built to accommodate members living farther away. In 1874 a second brick structure replaced the first. The church is known as the “Brick Church.” A new sanctuary was built in 1967-1968 which was connected to the older building. Their distinctive style of dress changed in the 1920-1930’s and only the women occasionally wear prayer bonnets. The Brick Church, now the Nettle Creek Church of the Brethren, is located west of town on Brick Church Road. The German Baptists were intelligent, innovative and hard working people. They farmed, built mills and started other businesses. The Teetor family, later known for the Perfect Circle Company, came with this group. Their relative, Lewis Teetor, was an elder for the Brick Church for more than fifty years. He wrote a commentary on the New Testament and for twenty years was a trustee for Manchester College. In 1847 the final eight miles of the Whitewater Canal was completed from Hagerstown to Cambridge City. Hagerstown had formed its own company to finish the canal when it was stopped at Cambridge City. Flooding was a problem south on the canal so the canal engineer built Hagerstown’s section on the west side of the valley. It was several feet higher than the level of the stream. Because of the higher elevation, there was almost no flood damage to Hagerstown’s end of the canal. However farther south, floodwaters damaged the canal in 1847 and again in 1865. The costly repairs and poor return on investments caused the canal to go out of business. The Big Four Railroad built on the old towpath of the old canal with the terminus at Hagerstown. A turntable and engine house for the railroad were at the south end of town on Washington Street. Passenger service was discontinued in the 1920’s but freight service on the Big Four continued until 1931. The Pennsylvania railroad line from Chicago to Cincinnati also came through Hagerstown and the line now is called the Norfolk Southern Railway. In 1895 a new Hagerstown business was organized, the Railway Cycle Manufacturing Company. 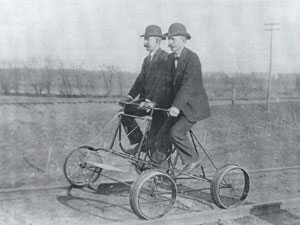 Charles N. Teetor invented a “railway cycle” which became the Light Inspection Car for inspecting railroad tracks. Later the company (Teetor-Hartley Motor Company, 1914) manufactured automobile motors. They produced many engines for Indiana car makers and the Auburn was their largest customer. The company sold the motor division but kept the growing business of piston rings. In October 1926, the name was changed to the Perfect Circle Company. It became one of the largest piston ring manufacturers in the world. Charles N. Teetor and his brothers were leaders in the early automotive industry. C.N. Teetor’s nephew, Ralph, continued to invent new products for the company such as the Speedostat. The most remarkable part of Ralph’s story is that he lost his sight when he was five years old. But blindness did not keep him from a brilliant automotive engineering career. C.N. Teetor died in 1937 and Ralph died in 1982. Perfect Circle was sold to Dana Corporation in 1963 and the Hagerstown facility closed in 1995. The Teetor’s factory brought many good jobs. Youngsters graduating from high school could work in the factory right at home. During the 1930’s depression, Perfect Circle shortened work hours to keep as many employees as possible receiving a paycheck. Perfect Circle was generous to the town and to the area. They gave money to the school, for the public library, and provided machines and tools for the high school Industrial Arts classes. In 1956 Perfect Circle gave a large donation to Cambridge City for their new gymnasium. Camp Wapi-Kamigi, a woods and lake property south of town, was acquired for Hagerstown Girl Scouts with the help of Ralph and Nellie Teetor. Summer camps for Girl Scouts of the Treaty Line Council were held there until it closed in 1995. Boy Scouts started in Hagerstown in 1912. Merton Grills, one of the early Scout-masters, set up a college scholarship fund for students graduating from Hagerstown and Cambridge City schools. There are many interesting characters in Hagerstown’s past. Johnnie Horine was known as the “globe-trotting bootblack.” Johnnie shined shoes and saved his small earnings for his world travels. He traveled to the Middle East and the Holy Land in 1925 and attended every World Exposition from the 1890’s. Johnnie started his trips on his lucky day, June 21, the longest day of the year. Ted Sedgwick was another memorable person. He worked with the Boy Scouts in Hagerstown for thirty years. Sedgwick is fondly remembered for his patient teaching by students who took shop classes during his thirty-nine years at the high school. For about twenty-five years a tent theater was set up across the street from Welliver’s Restaurant. The Nettle Creek Players gave live productions during the summer with the help of local actors and young professionals. Through the years the theater had difficulty in maintaining itself even with the help of local supporters. The last season for the tent was 1996 and its future is uncertain. For many years Nettle Creek Players presented fine family entertainment on Main Street. In 1962, Harrison, Clay, Perry, Dalton, Jefferson, and half of Liberty Township in Henry County consolidated into the Nettle Creek School Corporation. A new elementary school in Hagerstown was completed in 1968 and the high school on Baker Road in 1971. Hagerstown has a five-member police department and a volunteer fire department. Historic Hagerstown formed in 1974 and purchased the three-story I.O.O.F. building at the corner of Main and Perry streets. They established a museum on the two top floors, continuing to rent business space at the street level. The second floor auditorium is decorated with murals painted in 1913 by local artist, Charles Newcomb. The large room held the school graduations from 1882-1922. It was used for plays, dances, concerts, and as a skating rink. In 1982 the town celebrated one hundred and fifty years. People from all over the township and beyond served on committees and helped with the celebration. About half of the population of Jefferson Township lives in the Hagerstown area. Many new homes are being built outside of the corporation as farm lands are being divided for housing. A new large elevator was built south of town and the Nettle Creek/ I-70 Industrial Park is planned close by. A water tower has been erected and sewer lines have been installed to accommodate the expected industrial growth. Jefferson Township has some of the best farming ground in Wayne County and there are still a few homestead farms which have remained in the families of early settlers. Hagerstown is best known for Perfect Circle, Tedco, Welliver’s Restaurant, the Nettle Creek Players and Abbot’s Candy. Several new shops and restaurants have opened downtown in the past few years. The Library built an addition in 1989 and the new city building was built in 1992. Hagerstown’s Hometown Christmas has become an annual event which includes a Sunday evening tour of Jefferson Township churches.